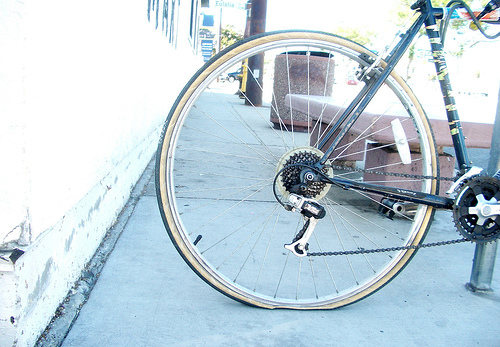 Flat tires are an inevitable part of biking, but can ruin your day if you're not prepared. Photo via 7-how-7. On June 23 the Goethe-Institut in Washington is hosting an event, Biking, Walking, and Public Transport: Smart Mobility for the 21st Century. The event will kick off at 6:30 p.m. with a “hands-on” demonstration on how to change a bike tire with D.C. Bike Ambassador Daniel Hoagland. The discussion panel will follow at 7:00 p.m.Panelists David Alpert (Greater Greater Washington) and Ralph Buehler (Virginia Tech University, Smart Bike), and moderator Arne Jungjohann (Heinrich Böll Foundation), will discuss what can be learned from cities across the world to improve the safety, convenience, and feasibility of non-motorized modes of transportation. 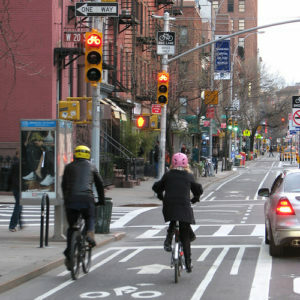 Wide bike lines, like this one on 9th Avenue in New York, make non-motorized transportation safer. Photo via K_Gradinger.